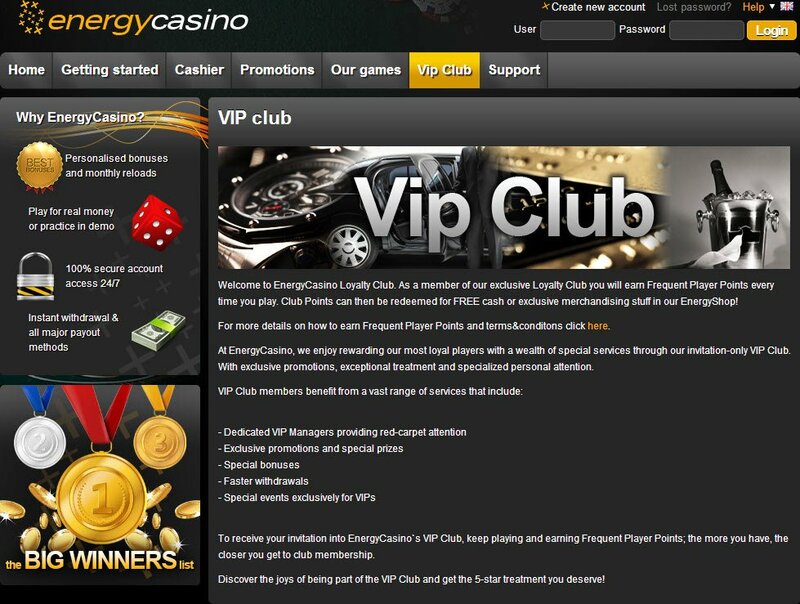 Launched in 2012 and operated by operated by Probe Investments Limited, Energy Casino is registered and licensed in Malta by the Lotteries and Gaming Authority (LGA). Presenting a simple, grey-toned background, with a splash of energetic yellow colour to highlight what it is offering, Energy Casino games come with an energetic and exquisite twist! With no need to download Energy Casino to get playing, you can just sign up within an instant for browser play and all the sweet promotions and bonuses available to registered Energy Casino players. Boasting a 45 second sign up, I am delighted to say that they were indeed overestimating. With clear ticks next to each different piece of information to prevent errors from being made, and the sign-up sheet refreshing and clearing all your carefully input data due to a silly mistake that you didn't notice. One of the few casinos running Novomatic games Energy Casino is a bright spark amongst online casinos for that very reason. Novomatic games load fairly quickly, but this, as always, is largely dependent on your bandwidth and how many TV shows and films, like Casino Royale you are currently downloading on torrents. Energy Casino Novomatic games have sublime graphics, they are sharp and clean, offering a unique playing experience. Musical accompaniments range from annoying catchy to insanely moreish. They come with a beat that helps the quality graphics ability to steer off the beaten track when it comes to the ideas behind the addictive games. The gamble option available when you have won your wager on the Novomatic slots manages to give you the atmosphere of a real live casino. I also really appreciate the option to shorten my spin by clicking start, to bring those Energy Casino reels to a sudden stop before the automatic spinning time is up. The music really heats up when you get a winning line or two, and helps spur you into spinning action! 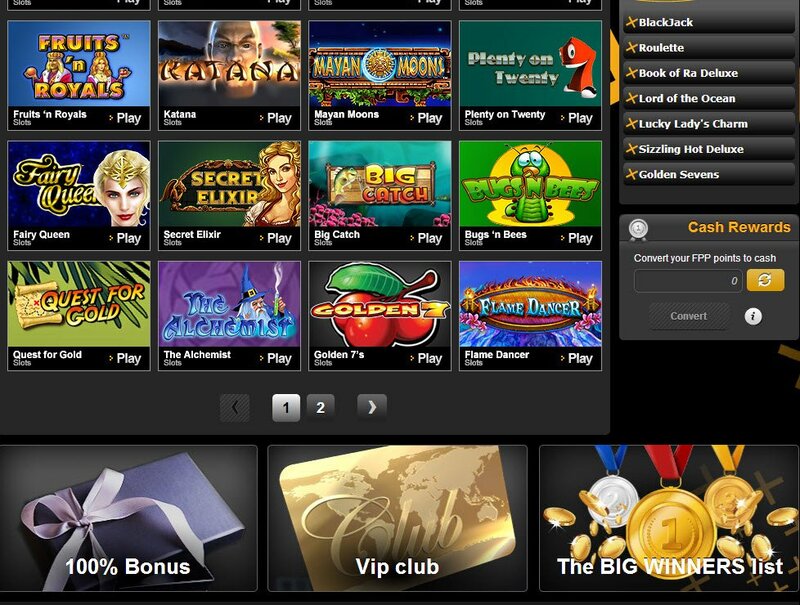 Energy Casino Novomatic games are best known for their juicy payouts. The second you activate your account and start playing, you will receive your Energy Casino bonus and be eligible for all the exciting Energy Casino promotions around. 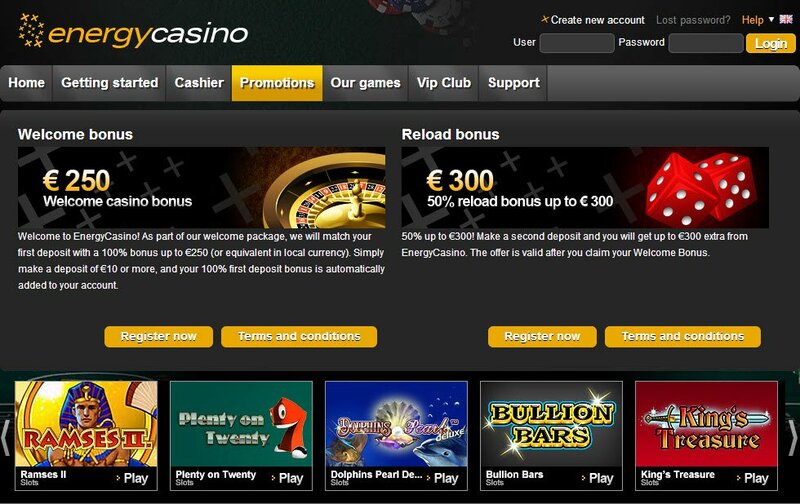 You'll receive a 100% welcome bonus, up to €250 (or equivalent in your playing currency. There's also a nifty 500 virtual credits up for grabs. There is also a reload bonus, in case you didn't feel welcome enough the first time - 50% up to €300. If you are lucky enough to be invited to walk up that notorious red carpet, you will receive VIP Energy Casino rewards, including faster withdrawals of your winnings, and special events. Showing some deposit methods I have not come across before, Energy Casino payment methods are a multitude of usefulness. There's eKonto, Neosuf and the usual, well known parties too. Customer Service is offered over phone, post, email and live chat, and although claiming to be available to help 24/7, live chat was offline when I went to ask my usual barrage of inane questions to test them out. Customer support at this casino is excellent! I emailed them, and literally within 10 minutes I had a reply. There dont seem to be too many casinos using the Novomatic software, so Im quite interested in giving this one a try. I know that Novomatic are responsible for the Sizzling Hot Deluxe Slot and the Book of Ra Deluxe Slot. I am a big fan of the original classic slots, so Im looking forward to seeing what these deluxe slots are all about.